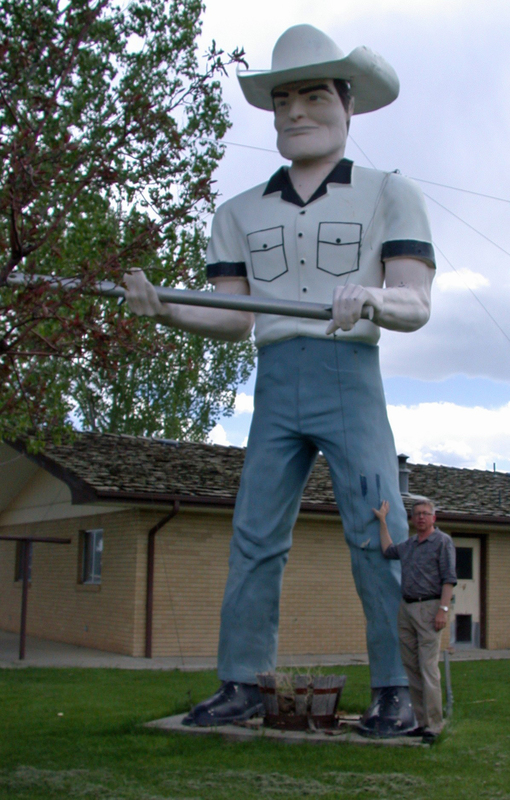 Colorado Muffler Man – The Home of My "Big Things"
Here I am “working” again. Actually we finished early and had some extra time outside Denver and decided to drive up to Estes Park for lunch. After a great lunch at the Estes Park Brewery we headed back to the airport. While driving along Colorado 66 and near Lyons I spotted this giant in someones front yard. I went to ask for permission to enter the yard and met Steve, hospital who, lo and behold, said that he had visited this website. “Sure,” he said. “Go take your photo.” Thanks Steve, you have a great view of the Rockies from your yard.